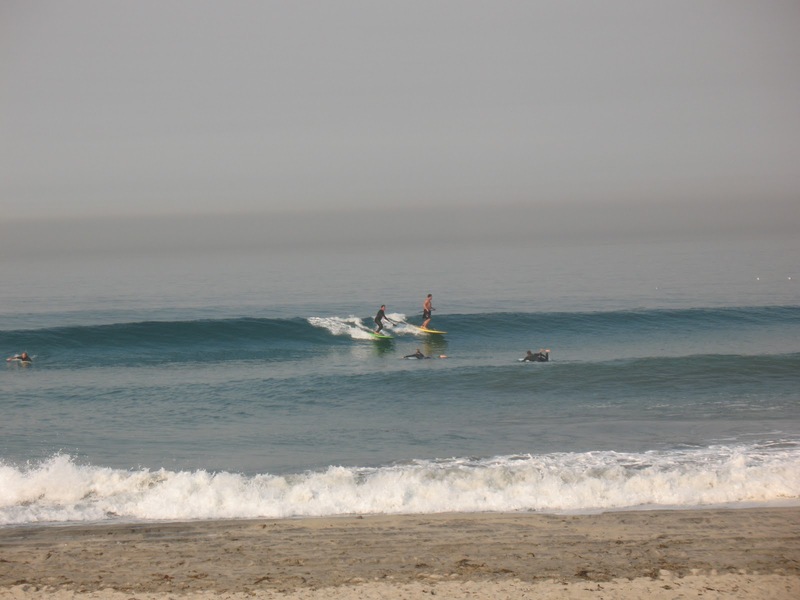 Stand Up Paddle Surfing: Boards/Friends... days gone by. Jeff Knox shot this photo when he was laid up from surgery and going crazy being landlocked. The board I was riding was the first one Tim Stamps made for me: 10' x 29.5", round tail with a full gloss and polish- he called it the Mahi because I wanted something with green, gold and blue in it. This wasn't my first standup board- it was, however, my first custom stando. After riding that, I never went back to the popout- the feeling just wasn't there. I ended up giving that board to my brother Mike who lives in Santa Cruz to get him started in stand up paddling- someday I'm going to reclaim it. The board was a great noserider- but the tail was wide and got skittery at speed- I tamed it by putting a 9" fin right at the back of the box- maybe that's why it didn't mind having somebody perched up front. Just another clean, high tide day down at the beach. That's Big Chad out in front of me on his first stando- the Laird 12'1". Those Lairds were pretty popular then- there weren't too many pop-out choices. Chad paddled that big Laird down the Colorado River in the one and only Hennessey's River race... he smoked me in that one. I gave up and sat on my board and drifted for a few miles, watching the fish swim under me and checking out the jet skis as they whizzed by. The support boat would come by and the helpers in it would yell out, "Water or beer?"... I never did take a beer- I definitely blew it. That's the Mahi II. On that one, we pulled the nose and tail in a bit more which calmed down the board when the surf got bigger and more powerful. 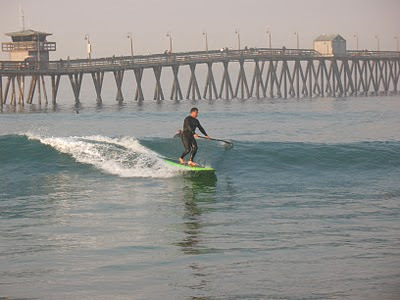 That board was 10' x 29.5" too but the rocker was different along with the outline- that board really started putting me where I wanted to be with stand up paddle surfing. It wasn't about cruising anymore, that board wanted to be pumped and driven- it was a fast board. I was still going with a 2 + 1 set up and I was using a big, sweepy, flex-fin that I would load up and twang off the bottom. I loved doing those big banana bottom turns- for me that was it, I could do them all day long and never get bored. I brought that board down to mainland Mex on my first trip down there with my friends Steve and Tucker- it was the right choice. I've been back many times since then but that first time down, with that board... I'll never forget it- it was awesome. By the way, I gave that board to my friend Tim Hatler who lives down in La Ventana, Baja California Sur- it's still down there and Tim loves it. Oh yeah, check out the two guys in the background. 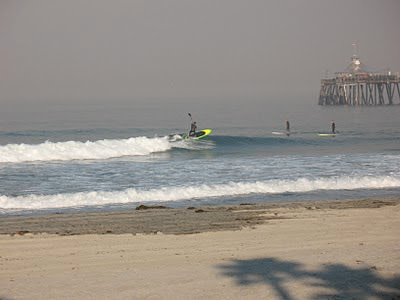 The one closest to me is none other than Kiwi on his first stand up board... the 12' Isle popsicle stick. Next to him is local boy and jet pilot Trent... we've all moved on to totally different types of boards and Kiwi's gone on to race like a madman on his hot Stu Kenson raceboard. I race too- my goal is to not be last.